Nobody said much when Oakmont Bakery unveiled frosted cookies bearing the likenesses of President Barack Obama and Republican nominee Mitt Romney in November 2012. Founder Marc Serrao’s bakery has been icing cookies with political candidates’ portraits since that technology became available. Four years later, the reaction was not as tempered. While customers bought red Donald Trump and blue Hillary Clinton cookies by the dozens, others couldn’t even bear to look. Some particularly incensed customers even wrote negative online reviews. Think of those as exceptions to the rule that is Pittsburghers loving Oakmont Bakery — the Best Bakery since 2013 and Best Dessert in 2014 and 2017, as voted by City Paper readers. Serrao has kept to himself his personal politics for years, long before the political climate had become so acrimonious that baked goods could be viewed as divisive. And he never wanted to make headlines for selling cookies related to hot-button issues. 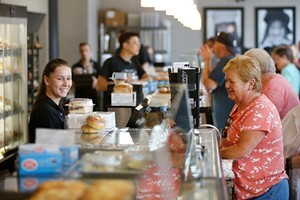 When he opened Oakmont Bakery 30 years ago, Serrao sought to create a neighborhood bakery with a great atmosphere. “The bakery’s a happy place,” he says. Another of Serrao’s goals when he took over a 1,200-square foot facility in 1988 was to create the best bakery in Pittsburgh. Three decades later, Oakmont Bakery has gone from just another neighborhood confectionery to a regionally recognized institution. One of the most popular “real deal” pastries at Oakmont Bakery is a Polish classic: paczki. Pronounced like “punch-key,” paczki are the richer, heavier, Eastern European cousins of donuts. They’re stuffed with whole fruit fillings or vanilla “Pittsburgh cream.” Paczki are traditionally eaten on Fat Thursday — though in America, they’re most commonly enjoyed two days prior on Fat Tuesday (aka Mardi Gras). And on Fat Tuesday every year, paczki lovers flock to Oakmont Bakery and buy more than 5,000 of them. While cookies featuring presidential candidates’ mugs might get people talking in November 2020, it’s freshly baked staples such paczki that lead them to Oakmont Bakery time and time again.